Sauté the onion, carrot, garlic and bay leaf with the extra virgin olive oil over medium heat and cook until the vegetables are soft. Add the mince and brown it well, stirring to break up any lumps with a wooden spoon. Add the tomato paste and stir to combine. Add the stock, wine and Worcestershire sauce. Bring to a boil, reduce the heat to low and simmer until the sauce thickens. After 10 minutes, add the peas and keep cooking. When the meat is ready, add the parsley and season to taste. Keep aside. In the meantime, prepare the creamy mash. Put the potatoes in a pan and cover them with cold salted water. Bring to a boil over medium heat and cook them until they are tender. Drain the potatoes, rice them and return them to the pan. Add the cream and butter and stir well to combine. Season to taste. Divide the mince mixture between four 2 cup-capacity oven proof dishes. Top with the creamy mashed potatoes (I used a piping bag to make some nice patterns but this is not compulsory). 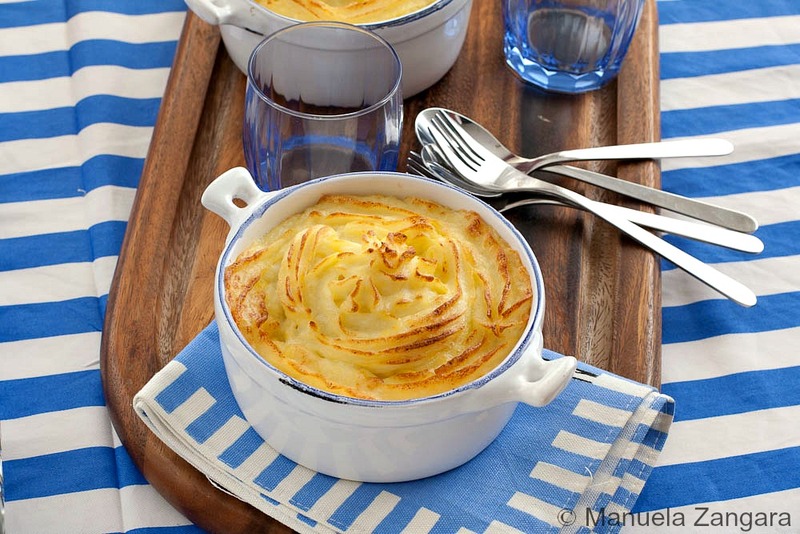 Bake the Shepherd’s Pies in a pre-heated oven at 200°C – 390°F for about 15-20 minutes or until golden. Serve warm with extra Worcestershire sauce on the side (optional).